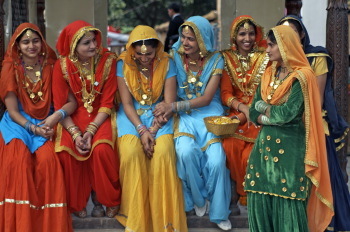 A group of women dress colorfully for an Indian festival. As a result of a calendar reform in 1957 C.E., the National Calendar of India is a formalized lunisolar calendar in which leap years coincide with those of the Gregorian calendar (Calendar Reform Committee, 1957). However, the initial epoch is the Saka Era, a traditional epoch of Indian chronology. Months are named after the traditional Indian months and are offset from the beginning of Gregorian months (see the table below). Despite the attempt to establish a unified calendar for all of India, many local variations exist. The Gregorian calendar continues in use for administrative purposes, and holidays are still determined according to regional, religious, and ethnic traditions. Years are counted from the Saka Era; 1 Saka is considered to begin with the vernal equinox of C.E. 79. The reformed Indian calendar began with Saka Era 1879, Caitra 1, which corresponds to C.E. 1957 March 22. Normal years have 365 days; leap years have 366. In a leap year, an intercalary day is added to the end of Caitra. To determine leap years, first add 78 to the Saka year. If this sum is evenly divisible by 4, the year is a leap year, unless the sum is a multiple of 100. In the latter case, the year is not a leap year unless the sum is also a multiple of 400. Table 5.1.1 gives the sequence of months and their correlation with the months of the Gregorian calendar. The Calendar Reform Committee attempted to reconcile traditional calendrical practices with modern astronomical concepts. According to their proposals, precession is accounted for and calculations of solar and lunar position are based on accurate modern methods. All astronomical calculations are performed with respect to a Central Station at longitude 82°30’ East, latitude 23°11’ North. For religious purposes solar days are reckoned from sunrise to sunrise. A solar month is defined as the interval required for the Sun’s apparent longitude to increase by 30o, corresponding to the passage of the Sun through a zodiacal sign (rasi). The initial month of the year, Vaisakha, begins when the true longitude of the Sun is 23° 15’ (see table below). Because the Earth’s orbit is elliptical, the lengths of the months vary from 29.2 to 31.2 days. The short months all occur in the second half of the year around the time of the Earth’s perihelion passage. 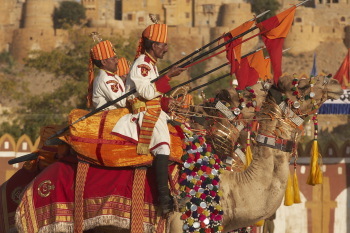 Camels and riders of the Indian Border Security Force perform a riding exhibition in front of Jaisalmer Fort. Each year, during the full moon in the month of Kartika, Rajputs lead their camels to Pushkar for the annual camel fair. 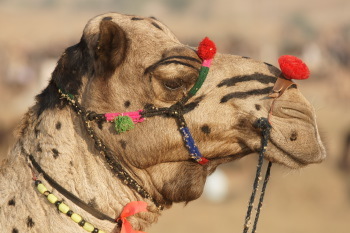 Owners paint and accessorize their camels for the annual Pushkar Fair in Rajasthan, India. At right, Rajputs are leading a camel herd to Pushkar, India. Each year during Kartik Purnima, which is the full moon in the Indian calendar month of Kartika, thousands of Rajputs lead their camels across the desert to the town of Pushkar for the annual camel fair. They come to sell, buy, and trade animals. Lunar months are measures from one New Moon to the next (although some groups reckon from the Full Moon). Each lunar month is given the name of the solar month in which the lunar month begins. Because most lunations are shorter than a solar month, there is occasionally a solar month in which two New Moons occur. In this case, both lunar months bear the same name, but the first month is described with the prefix adhika, or intercalary. Such a year has thirteen lunar months. Adhika months occur every two or three years following patterns described by the Metonic cycle or more complex lunar phase cycles. More rarely, a year will occur in which a short solar month will pass without having a New Moon. In that case, the name of the solar month does not occur in the calendar for that year. Such a decayed (ksaya) month can occur only in the months near the Earth’s perihelion passage. In compensation, a month in the first half of the year will have had two New Moons, so the year will still have twelve lunar months. Ksaya months are separated by as few as nineteen years and as many as 141 years. Early allusions to a lunisolar calendar with intercalated months are found in the hymns from the Rig Veda, dating from the second millennium B.C.E. Literature from 1300 B.C.E. to C.E. 300, provides information of a more specific nature. A five-year lunisolar calendar coordinated solar years with synodic and sidereal lunar months. Indian astronomy underwent a general reform in the first few centuries C.E., as advances in Babylonian and Greek astronomy became known. New astronomical constants and models for the motion of the Moon and Sun were adapted to traditional calendric practices. This was conveyed in astronomical treatises of this period known as Siddhantas, many of which have not survived. The Surya Siddhanta, which originated in the fourth century but was updated over the following centuries, influenced Indian calendrics up to and even after the calendar reform of C.E. 1957. The author Pingree provides a survey of the development of mathematical astronomy in India. Although he does not deal explicitly with calendrics, this material is necessary for a full understanding of the history of India’s calendars.